Following on the heels of yesterday's post, we have here a reworking of that same dungeon. The specific date of creation for this piece is January 26, 1996. I know this because, by this time, I was aware enough of my own need to be able to accurately place my creations on my personal timeline of gaming development so that I was more diligent about dating my creations. This made it easier to know to what era things belonged when I got swept up in the heat of nostalgia - which I was when I created this. A little background: I moved from Moldvay Basic D&D (my introduction to this hobby) very quickly. I got the boxed set for Christmas of 1981; by the spring of '82, I was incorporating monsters from the Advanced Dungeons & Dragons Monster Manual into the game; by the summer of '82, I was playing a mix of Basic D&D and AD&D (using my new Player's Handbook and Dungeon Master's Guide). I continued in this fashion until some time in 1983 or 1984, when I set aside D&D in favor of TSR's Top Secret. Except for occasional one-off games, I didn't play D&D again until, IIRC, 1989 (immediately following a three-year period where I gave up RPG's altogether). During that renaissance, I played full-on AD&D - Moldvay Basic was a topic of derision in my new gaming group. ("Race as class? Hah! What a joke!") 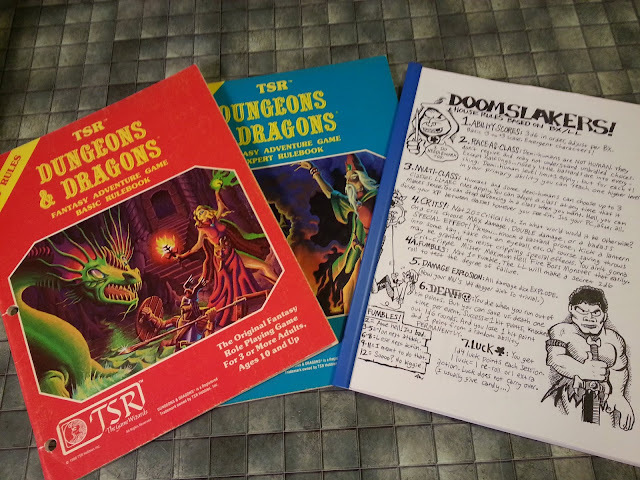 We played at least 14 or 15 AD&D games before the game was again shelved, this time in favor of embarking on the adventure of discovering many of the other role-playing games that I had previously overlooked, or that were just coming out. I gamed quite regularly with that group, and we tried a lot of different games - and indulged in a long-running series of sessions of Beyond the Supernatural, followed by an even longer-running series of Bureau 13: Stalking the Night Fantastic sessions - but we didn't return to D&D for a very long time. However, this being my gaming heyday, I had a fairly large pool of players, and varying subsets of the group not only played at different times, but often different games. This was especially true where my good friend Terry was involved - we played many solo games, because we liked games most of the others didn't. Terry also shared my penchant for indulging in bouts of nostalgia. This commonality resulted in a second D&D renaissance in the mid-90's. We wanted to go back to our roots, so we opted for Basic D&D - this time, though, the rules came in the form of the Rules Cyclopedia. During this period, I created a number of "dungeons" - some of my best, IMO - of which the following is an example. 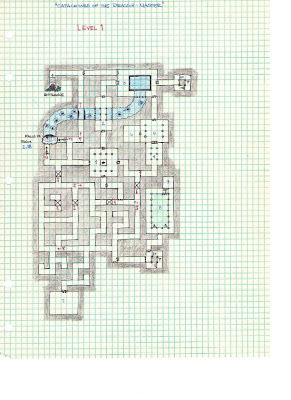 As I mentioned in reply to a comment on my first dungeon ever, the location descriptions for this dungeon were written out on the same paper I used to map and describe my dungeons in the early '80's. This was done on purpose - to preserve the sense of nostalgia. I have printed them out, and they look very crisp.